Keep your handbag tidy with your very own custom printed zipper pouch. Made from our Neoprene wet suit material, its strong stretch and heavyweight quality makes this an ideal pouch bag for makeup, accessories and other day-to-day essentials. Featuring a secure zip, custom bags like this quickly become an everyday staple. Pouch dimensions - 8 x 5"
Made from thick, durable Neoprene, these custom zip bags are designed to be everlasting so there’s no need to worry about wear and tear. Both the front and back are printed with your photos or design for maximum effect, and you can add text to personalize with a name or message for a special touch. You can also have complete trust that your belongings are secure in the personalized zip pouch. The quality and design of the product is superior to others in the market. Your turn-around time on an order is outstanding--don't have to wait 6 to 8 weeks to receive the product. You are great to work with--love it! Very pleased with when my order arrived. Very good quality. I really loved the zip top pouch. I was really able to personalized it for exactly what I wanted. I will be recommending Bags of Love to others! What Will My Customer Zippered Pouch Actually Look Like? The pouch bag is printed on both sides, giving you the opportunity to create something bursting with color and life. 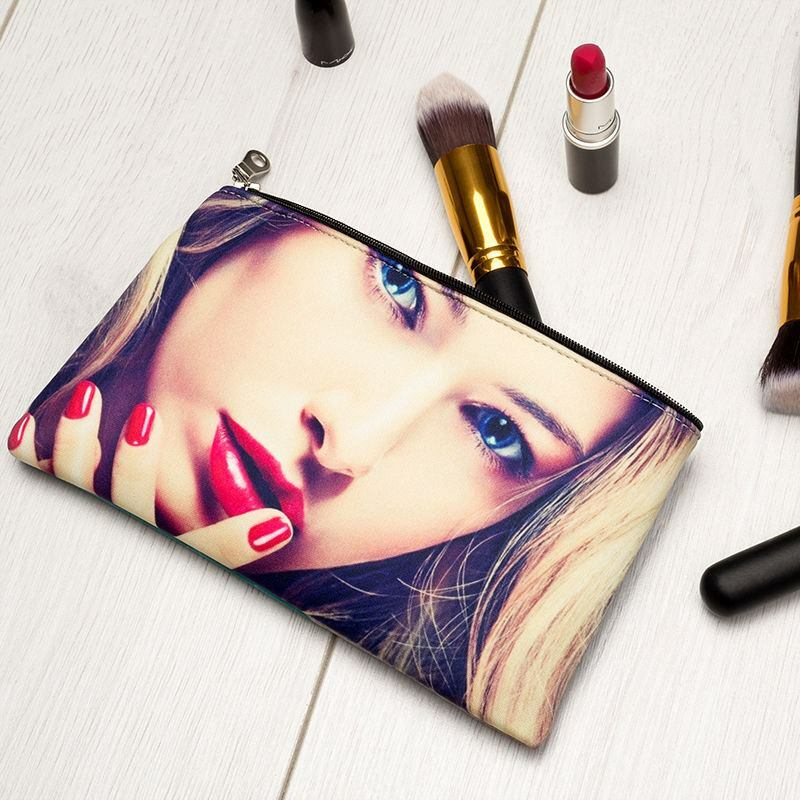 Ideal as a substitute small cosmetic bag, you can easily fit your daily beauty products, hand sanitizer, body spray etc and because the Neoprene is tough and flexible, it can support odd or angular shapes without any damage. For extra personalization, the zip trim can either be ivory beige, pale blue, soft pink or black, allowing you to keep your colors consistent. Who Would Use a Zipped Cosmetic Pouch Bag? They’re super handy to help a woman organize her handbag and keep important things safe, so a small cosmetic pouch is ideal for your grandma or mum who finds themselves rummaging around for ten minutes before finding what they were after. The variety of ways to use your custom zipper pouch printed with your unique images doesn’t end there, as they’re also good for general bits and bobs like hair bands, clips, pens, mints…the list could go on! Like many of our products, the custom zip bag comes with a quantity discount so buy more than 1 today and save money. Your zip pouch bag has been lovingly handmade by our passionate textile experts, from the printing and careful cutting through to the stitching. The intense colors won’t fade or rub away due to the specialist process of bonding the ink to the fabric. The end result is a beautiful unique pouch bag that will fit nicely inside your handbag. Care: delicate cold wash and cold tumble. Or wipe clean with a damp, soapy cloth. Your custom pouch bag with zip is landscape so for best printing results we’d advise choosing a photo or design that fits the width, or go for a photo collage of all your favorite snaps. For a simple but tasteful design, why not print your name or a meaningful quote on the front, but feature a special photo or design on the back. This essentially gives you two zip pouch bags for one! If you’re using your pouch bag for makeup, consider something a little edgy such as lipstick kisses or pouts.